This month Ink International is privileged to honor the work of Kathy Byrd, from Nettleton Junior High School (Jonesboro, AR). Kathy Byrd has worked in education for the past 30 years and has served as the mentoring sponsor at her school for the past nine years. She earned a bachelor’s degree from Notre Dame. During her eighteen years at Nettleton Junior High, she has worked as a special education teacher and a literacy teacher. Nine years ago, Byrd launched the Big Sister/Little Sister Program, later known as Ladies of Distinction (a schoolwide mentoring program) that works with culturally diverse young girls from elementary to high school. Byrd has been invited to share the frameworks of this mentoring program at the National Anti-Girls Bullying conference in Las Vegas in June 2015. Along with the girls program, Byrd also successfully implemented a boys mentoring program, The Gentlemen of Knowledge, four years ago. 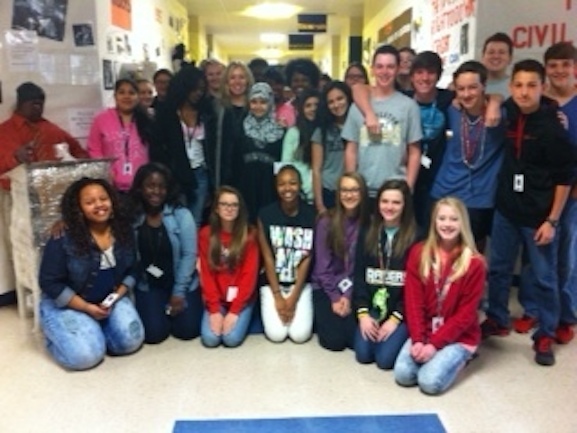 Photo: Nettleton Junior High 8th grade students working on Civil Rights Museum with teacher Kathy Byrd. Ink International engaged Kathy Byrd in a short Q&A, below. Can you talk about what prompted you to have Manny speak to your students and about the reaction at the school after his visit? I have always had an interest in the Freedom Writers since the movie came out in 2007. I took my first group of eighth graders to see the movie and their response was, “She is just like you Mrs. Byrd." I began a successful unit every year that focused on developing curriculum similar to the Freedom Writers. We read relevant novels, watched the movie in class and participated in speaking and writing activities that dealt with my students' stories, which were very similar to the movie’s portrayal of life as a teenager. When my principal mentioned she had heard Manny Scott speak at a conference in the summer of 2014 and how amazing his story was, thus began our quest to raise the money in our school to book him for a speaking engagement. Due to snow in March 2014, we had to cancel and rebook for October of the next school year. His message in October was very uplifting and touched the hearts of everyone, including those who doubted that one man could make a difference. He inspired students to never give up and to believe in themselves. He told his story to not a dry eye in the crowd and before it was over, students were embracing other students that they did not normally talk to. My students all felt that, no matter where they came from or how bad their life was at this moment, it could and would get better. He changes the hearts and minds of those he meets and leaves us with the hope that we all can do better. Why are you so passionate about reaching and teaching kids? What do you think is most important for people to understand today about reaching students today, not only in Arkansas, but also across America? What do you think is most important for people to understand about the work Manny and Ink is doing? The most important thing one needs to know to prepare students for tomorrow, is to enable them to become thinkers and doers. They must be able to have an opportunity to think on their own and to make decisions for themselves. My students know that I will never give up on them and I push them to do the best they can. I remember Manny Scott saying, “on your worst day, you are a student's only hope.” This has stayed with me, and I think of this often. Manny Scott brought hope to hundreds of our students the day he spoke. He made them believe in themselves and realize it is never too late to start over or begin again. He filled our students with hope, understanding and love. Many committed their life to start helping others and they now believe that they can tell their stories without being judged. They feel safe from harm and better about themselves. He made a difference in the lives of everyone that day. My students look forward to turning the page in their own lives.